The Bottom of the Sky is an aching rags-to-riches family saga that surges from the fringes of a Montana coal and cattle town into the opulent powerful chambers of Wall Street and Silicon Valley, written by a man who lived both. The story contrasts the 30-year struggles of an abused sister and brother who seek to reclaim themselves from their abhorrent past. One is abandoned to desecration and addiction. The other escapes and wields fragile, uncanny genius to amass dynastic wealth. Greed and betrayal power a tense plot involving the SEC, the FBI, and billions of dollars fleeced from every-day brokerage customers and shareholders, while isolation and envy lead to horrific confrontations back home. 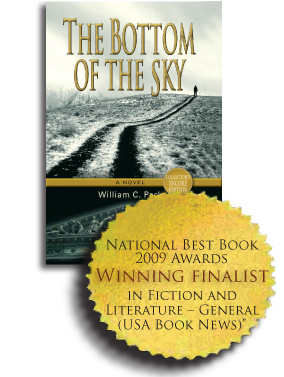 The Bottom of the Sky deals head-on with profound shame, promiscuity, madness, and violence even as it exposes the callous secrets shared by Wall Street and the silicon robber barons. This is the riveting, thunderous tale of two disparate worlds jointed by one desperate man and his ultimate redemption.